THE HEROESONLINE BLOG | FREE COMIC BOOK DAY @ HEROES :: THE COMICS! FREE COMIC BOOK DAY @ HEROES :: THE COMICS! 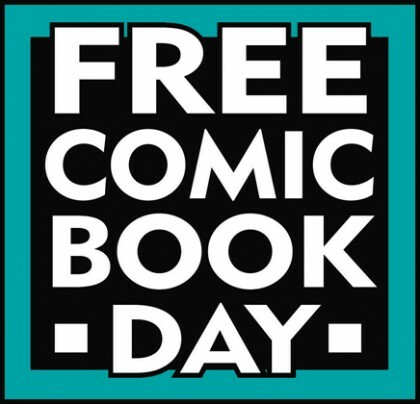 THIS SATURDAY IS FREE COMIC BOOK DAY AT HEROES AREN’T HARD TO FIND! Here’s your guide to the FREE COMICS we’ll have on hand this Saturday, May 4th at our FCBD event! Doors open at 10AM; get here early to make sure you get the books you want! Our creator signings begin at 1PM, more info on that here. We’ll see you Saturday! *Please be respectful of others when making your selections, supplies are limited and we want make sure as many people as possible get the comics they want. Taking multiple copies of one title is not nice! Be nice and we will all have a great time! ATOMIC ROBO & FRIENDS |FREE! AVENGERS ASSEMBLE HULK AGENTS OF SMASH #01 |FREE! CAPSTONE PRESENTS MR PUZZLE |FREE! DC NATION SUPER SAMPLER #01 |FREE! DH MASS EFFECT KILLJOYS RIPD |FREE! DH STAR WARS CAPTAIN MIDNIGHT AVATAR |FREE! DRAGON BALL & RUROUNI KENSHIN RESTORATION |FREE! FINDING GOSSAMYR STUFF OF LEGEND |FREE! ITS AN UGLY DOLL COMIC & OTHER STUFF |FREE! KELLERMAN L AMOUR SAMPLER |FREE! MOLLY DANGER / PRINCELESS |FREE! MOUSE GUARD / RUST FLIP BOOK |FREE! NFL RUSH ZONE SEASON O/T GUARDIANS |FREE! OVERSTREET COMIC BOOK MARKETPLACE |FREE! PIPPI LONGSTOCKING COLOR SPECIAL |FREE! RATED FREE FOR EVERYONE CROGAN ADV & MERMIN |FREE! SESAME STREET & STRAWBERRY SHORTCAKE |FREE! SONIC THE HEDGEHOG MEGA MAN FLIPBOOK |FREE! SPONGEBOB COMICS FREESTYLE FUNNIES |FREE! STAN LEE CHAKRA THE INVINCIBLE PREVIEW |FREE! STEAM ENGINES OF OZ |FREE! SUPERMAN CUSTOM ED HEROES HARD 2 FIND |FREE! THE RED TEN #0 |FREE! TMNT NEW ANIMATED ADVENTURES |FREE! TOP SHELF KIDS CLUB |FREE! VALIANT MASTERS SHOWCASE ED |FREE! WORLD OF ARCHIE DIGEST |FREE! A free chunk of beautiful Sunday Newspaper comics is very much like the free samples you get at Sam’s Club or Costco. Once you’ve tasted what is offered, you can’t live without and you’ve gotta have it–in Bulk. Fortunately, Heroes has plenty of Comic Strip reprints in stock!! What a day!! Most Comic Shops offer an an inch–you guys give us a mile!! Thanks!! ← HEROESCON 2013 :: GUEST LIST UPDATE :: AMANDA CONNER! TOMMY LEE EDWARDS! BERNARD CHANG! JIMMY PALMIOTTI! & MORE!